The Gateway Division NMRA Saturday Operations Night will be Saturday, April 30, 2016. Operating sessions for NMRA members only are available at three area model railroads. The operating sessions start at 7 p.m. Contact Chris Oestreich to sign up at oestreich62@yahoo.com or 636-207-1704. Not an NMRA member? Contact us to find out how to join! 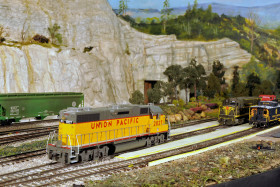 The Union Pacific Wyoming Division is the place to experience big time western railroading from the classic era. One run you may be at the throttle of a 4000 (Big Boy to those that aren’t UP fans!) with a drag freight in Weber Canyon and then be called for a Big Blow with a reefer block for Track 3 over Sherman Hill. This fully sceniced railroad features DCC and sound with a C&S mainline to Denver along with the UP mainline over Sherman Hill. Lots of passenger trains are on the schedule with the City of San Francisco, The City of Portland, The City of St. Louis, The Utahn, The San Francisco Overland, The National Parks Limited, the High Plains Rocket and the Wyoming Zephyr all on the card. A Rock Island and Union Pacific branchline adds variety. Car Card operation through prototype scenes with historical accuracy makes this a fun layout to operate. The ATSF Kansas Division is the combined work of Jay and Jeremy Janzen. The layout is based on the Santa Fe Railroad’s transcontinental mainline through central Kansas. The modeled portion portrays the line from Walton, Kansas to Dodge City, Kansas with staging representing connections to Los Angeles, Chicago and multiple points in between. 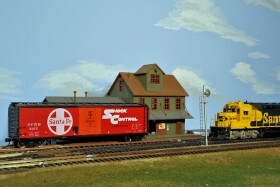 The layout is HO scale and is controlled by Digitrax brand DCC. Layout design is multi-deck based on John Armstrong’s mushroom design and the visible portion has one major yard and 7 passing tracks. Layout features a mix of through trains and locals using both freight and passenger trains. All traffic on the main tracks are dispatcher controlled using a custom JMRI based control panel. Car movement is by switch lists. The layout is fully signaled and trains move across the layout via signal indication. Communication with the dispatcher is done using a phone system. Available jobs include yard switchers, road crews, and local crews. The layout is in the basement accessible by stairs. The layout can handle 7 operators. The layout runs modern era equipment in a 45’x25′ room. The era is June 2000. The rolling stock, and engines start approximately 1980-1982 ending in June 2000 (when Union Pacific changed their wings on the herald). The layout is HO scale, and is controlled by Digitrax DCC. New trains run using a switch list generated by JMRI Panel Pro. The Sierra Nevada and Indian River Railroad is actually a branch line that was purchased by three guys and routes the cars through the interchange yard at Reunion coming off of Union Pacific, Norfolk Southern, and Burlington Northern Santa Fe. The Sierra Nevada and Indian River railway then routes all the cars to the different industries around the layout. The mainline is composed of concrete tie track from Micro Engineering. The Sierra Nevada is wooden tie flex track, all the track is Micro Engineering, which was used for its reliability and appearance. The cars are uncoupled using magnets set in the track. The skewers system is not used because Brian doesn’t want people reaching into the layout. He wants them to use the magnets, which is more prototypical. Seven turnouts are thrown through the throttle. All engines are decoder equipped, approximately half of them have sound. Almost everything on the layout is diesel but there is a logging shay that runs from Sierra logging company over to the town of Preston hauling logs. The railroad itself generally handles wood products. 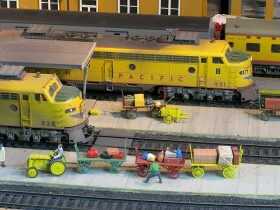 There are also numerous industries on the layout. Operations on this layout are for nine operators. There is a dispatcher, three yard masters, one for Reunion, one for Sarah, and one for Preston. Reunion yard is the hardest job on the layout because if it’s not done properly it backs up all the local trains and all the manifest trains trying to switch. There are also usually two manifest trains, one out of Blessing yard and one out of Cocoa yard. There are usually at least two local switch jobs. They can originate in either Reunion, out of Sarah, or out of Preston. Sometimes there are also passenger excursions pulled by either steam locomotives or diesels. The usual time to operate this layout is at least 3 hours.